By Patrick Martin wsws.org: The Hillary Clinton campaign used its financial resources to take control of the Democratic National Committee more than six months before the first primary vote, using the party machinery to insure Clinton won the presidential nomination, according to a new book by a top Democratic insider. Donna Brazile, longtime vice chairman of the party, campaign manager for Al Gore in 2000, and interim chairman of the DNC from July 2016 to February 2017, makes the explosive revelation in her newly published account, Hacks: The Inside Story of the Break-ins and Breakdowns that Put Donald Trump in the White House. A chapter of the book was excerpted Thursday on the Politico web site, under the headline, “Inside Hillary Clinton’s Secret Takeover of the DNC.” Brazile writes that soon after she became interim chairman after the Democratic convention in July 2016, she began investigating charges of collaboration between the previous DNC chair, Representative Debbie Wasserman Schultz, and the Clinton campaign. She discovered in the DNC files a signed agreement between the Clinton campaign and the DNC, dated August 2015, in which the Clinton campaign was given effective control of DNC decision-making in return for bailing out the DNC financially. 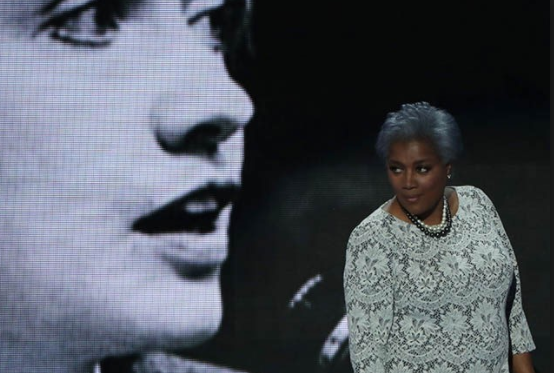 Brazile admits the grossly anti-democratic character of this arrangement, given that the Democratic presidential nomination was a contest between at least five candidates at that point, two of them, Clinton and Sanders, with substantial support. In all previous such contested races, the rules of the DNC had required it to remain neutral. Brazile is defensive about the legality of the arrangement for good reason: it involved a brazen effort to evade restrictions imposed by federal campaign finance laws, which limit to $2,700 the amount that an individual can give to a presidential campaign. Under the deal brokered with the DNC, wealthy donors could pump $353,400 into the party’s coffers, $10,000 to each of 32 state parties that participated in the scam, and $33,400 to the DNC itself, in each case, the maximum allowed under federal law. All these funds would be deposited in the accounts of the various state parties and the DNC. Most states would send their money back to the DNC, and the DNC would funnel the whole sum to the Clinton campaign. In the end, the state parties retained less than one percent of the $82 million raised in this effort. Similar money trails have been a staple of both Democratic and Republican fund-raising efforts for the last several presidential election cycles, but the 2016 campaign was the first in which such flimflam was conducted before the party had selected a presidential nominee, and months before a single vote had been cast in a caucus or primary. Some 12 million people, with a preponderance of youth and students, voted for Bernie Sanders in the Democratic primaries and caucuses, attracted by his claim to be a socialist and his denunciation of the grip of “millionaires and billionaires” on the US economy and political system. But he was seeking the presidential nomination of one of the two parties controlled by the billionaires and unshakably committed to their interests, as demonstrated by the blatant purchase of the DNC for $20 million by Hillary Clinton, the favored candidate of the financial aristocracy in 2016. The US ruling elite was shocked and surprised by the mass support for a candidate claiming to be socialist—none more so than Sanders himself. His major service to Wall Street was to divert this popular following back into safe channels, by wrapping up his campaign and throwing his support to Hillary Clinton at the convention. Brazile notes in her memoir that she called Sanders in September 2016 to tell him about her discovery of a formal agreement between the Clinton campaign and the DNC. “I had promised Bernie when I took the helm of the Democratic National Committee after the convention that I would get to the bottom of whether Hillary Clinton’s team had rigged the nomination process,” she writes. This gives a glimpse of the real politics of Sanders, who agreed to Brazile’s entreaty not to “kill the patient,” i.e., expose the Democratic Party and the Clinton campaign by making public this stinking backroom deal.